The bill seeks to establish a juristic person known as the Western Cape Special Economic Development Infrastructure Company SOC Ltd; to authorise the shareholding of the Western Cape Government in the company; to provide for the powers and duties of the company; to provide for the management, governance, funding and financial control of the company; and to provide for matters incidental thereto. The public hearing on 20 March will be held at the Atlantis Multipurpose Centre, Christopher Starke Street, Atlantis Industria from 18:00 to 20:00. Interested persons and organisations are invited to attend and to participate in the public hearing. Written submissions and requests to make verbal presentations on such submissions must be directed to the standing committee’s co-ordinator, Ms Zaheedah Adams, Tel 021 487 1641 or Email zadams@wcpp.gov.za. 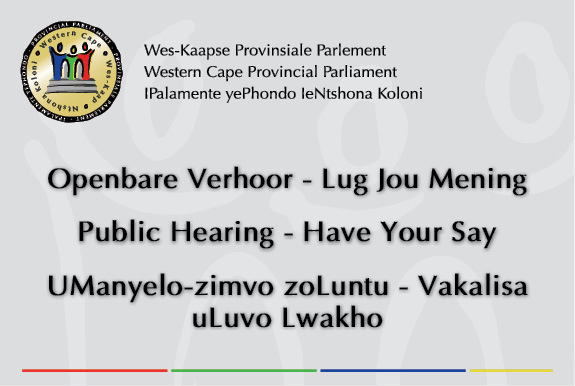 Requests to make verbal presentations at the public hearing must be submitted to the Committee Co-ordinator at least one day before the date of the public hearing. Written submissions must be received by Friday, 22 March 2019 at 12:00. Copies of the Western Cape Special Economic Development Infrastructure Company Bill [B3-2019] are available on request or click here to download a copy from the WCPP’s website.